The Vancouver Condo Buzz » From $199,900 (including parking!) 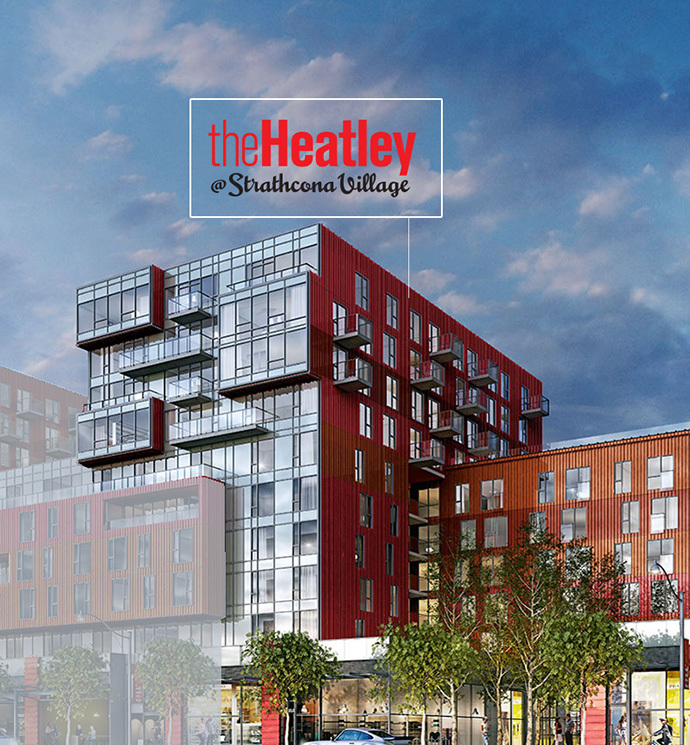 The Heatley at STRATHCONA VILLAGE Vancouver Condos for Sale! Opening June! From $199,900 (including parking!) The Heatley at STRATHCONA VILLAGE Vancouver Condos for Sale! Opening June! The Heatley @ Strathcona Village Vancouver Condos! A new project by Wall Financial is taking shape at 900 East Hastings Street Vancouver with an exciting launch of new homes from just $199,900! Called The Heatley at Strathcona Village, these downtown Vancouver condos are slated for a presales opening in June 2014. 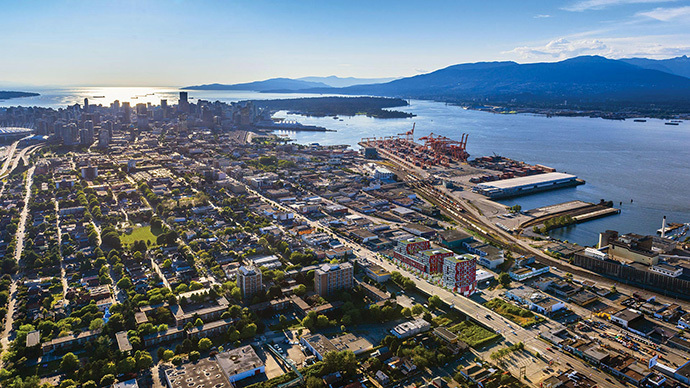 There will be approximately 283 condominium residences for sale in this first phase of Strathcona Village, the ultimate master-planned Vancouver affordable condo community commanding great views of the water, North Shore mountains and Downtown Vancouver. In addition, the prime location of Strathcona Village Vancouver condo project is within minutes of the downtown core, public transit routes as well as numerous boutique stores, grocers, cafes, services and the water. The first phase tower will feature a 15 storey mid-rise (approximate) with unit floor plans between the low 400 sf to mid 900 sf range. Parking is expected to be included in the pricing. This is straight from the website: ECLECTIC & UNIQUE HOMES at Vancouver’s Strathcona Village Heatley condos: Walk to work, or fire up your laptop in your home office, either way 900 Hastings Vancouver apartments has you ideally situated for life in the city with easy access to downtown – without downtown prices. With spacious floor plans, luxe furnishings, and incomparable views added to the mix, you may find your home becoming the gathering place for all your friends. The development will feature numerous on-site amenities that include a fitness centre, exercise room, outdoor courtyard and patio, garden plots and a meeting room. There will be underground parking as well as spots with electric car chargers! For more information about The Heatley Vancouver apartments, please visit the Strathcona Village website at www.strathconavillage.com today. 1 bedroom suites priced from just $199,900 with parking included for a limited time offer! 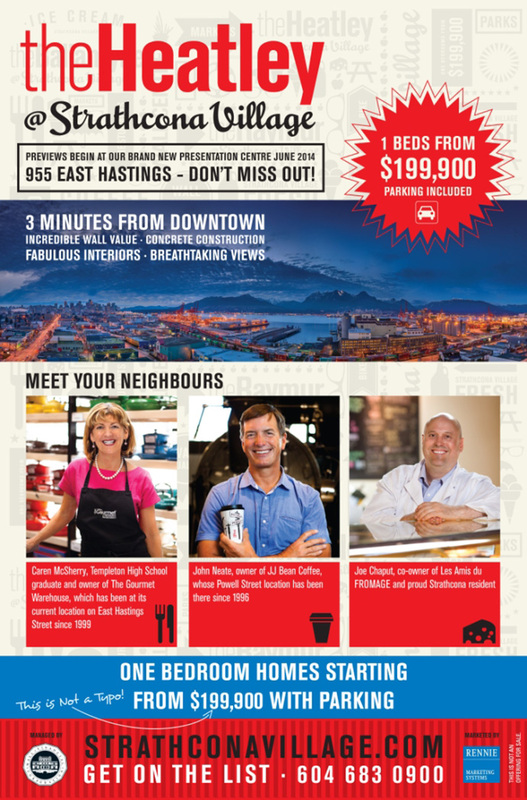 Introducing the new Vancouver Heatley condos at Strathcona Village. Previews will begin at the brand new Strathcona Village condo presentation centre which will be located at 955 East Hastings Vancouver, so don’t miss out on this ground breaking opportunity. 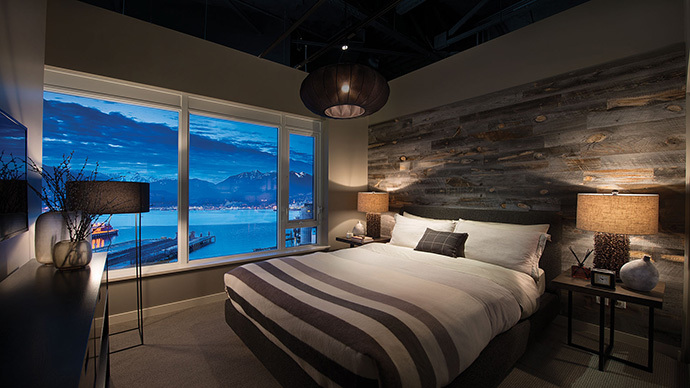 Just 3 minutes from downtown Vancouver with incredible Wall value and concrete construction, these amazing suites at The Heatley @ Strathcona Village will feature fabulous interiors and breathtaking views. Meet your neighbours: Caren, Templeton High School graduate and owner of The Gourmet Warehouse, which has been at its current location on East Hastings Street since 1999 > just a few minutes walk away from your new home at the Vancouver Strathcona Village Heatley condos! John Neate, owner of JJ Bean Coffee, whose Powell Street location has been around since 1996. And Joe Chaput, co-owner of Les Amis Du FROMAGE and proud Strathcona Vancouver residence. One bedroom homes at The Heatley Vancouver Condos in Strathcona Village start from just $199,900 with parking! Visit www.strathconavillage.com today and get on the list! The Strathcona Village homes will have 2 unique design colour palettes for presale homebuyers to choose from. The first of two beautiful colour schemes utilizes light wood tones, neutral finishes and shaker style doors. The second colour palettes features sleek, modern and glossy whites with charcoal (dark) accents). The Heatley Vancouver condos will also offer home buyers the option to upgrade the flooring to concrete inspired floor tiles that are low maintenance and very modern in style. 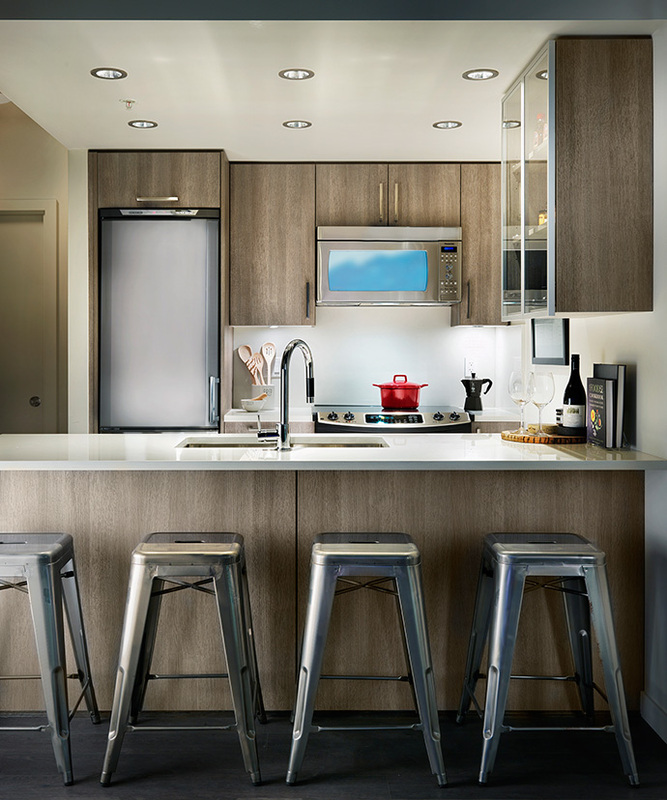 Here are some of the kitchen features at the presale Vancouver Heatley condos: open style designs with open shelving, airy living spaces and top of the line stainless steel appliance set will be standard in each and every home. 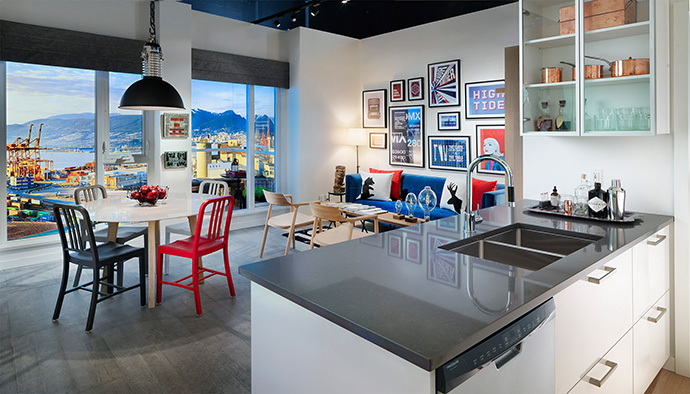 From gas cooktops and ovens to concreted inspired flooring tiles (upgrade option) or textured laminate wood floors (durable and modern), the kitchens at The Heatley @ Strathcona Village Vancouver will be chef inspired and ready to entertain guests. There will also be a convenient combo USB and electric outlet plug within the kitchen space for your conveience in addition to slick quartz composite stone counters and backsplashes, luxury finishes usually reserved for high-end downtown Vancouver apartments. As well, the kitchens at the Strathcona Vancouver Heatley condos will include a stainless steel backsplash, Porter & Charles gas cooktop, oven and dishwasher in addition to a Liebherr Energy Star fridge/freezer with cabinet-front finishing. 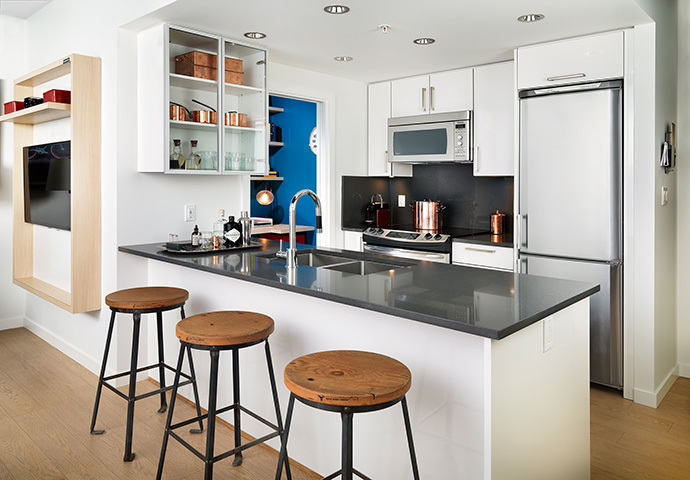 As well, home owners can enjoy durable laminate cabinets in 2 colour schemes (as described above) in addition to a Grohe chrome kitchen faucet and extra open style shelving. 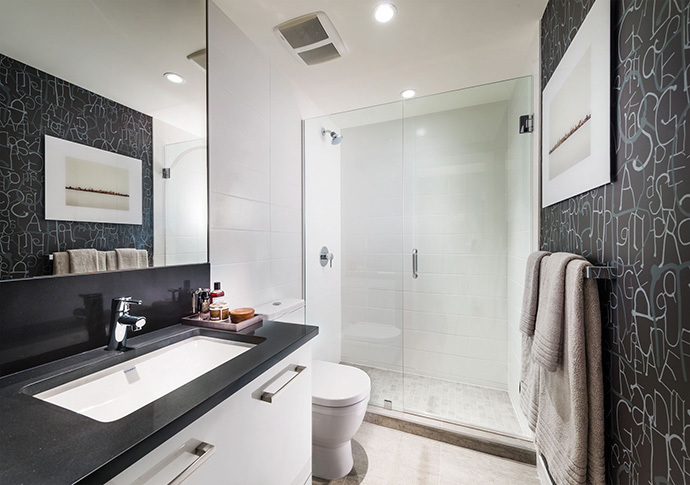 The luxurious bathrooms at the presale Vancouver Heatley Strathcona condos will present slick quartz composite stone countertops and Grohe polished chrome sink faucet with WaterCare technology for great water conservation ability. As well, the modern bathrooms will have sleek Philippe Starck dual flush Duravit toilet and modern soaker tub in the ensuite. Some of the bathrooms will have frameless glass shower. The spa inspired bathrooms at the Strathcona Village Vancouver Heatley condos will feature thoughtfully designed vanity to maximize space and utility/storage. Walk to work, or fire up your laptop in your home office, either way 900 Hastings has you ideally situated for life in the city with easy access to downtown – without downtown prices. 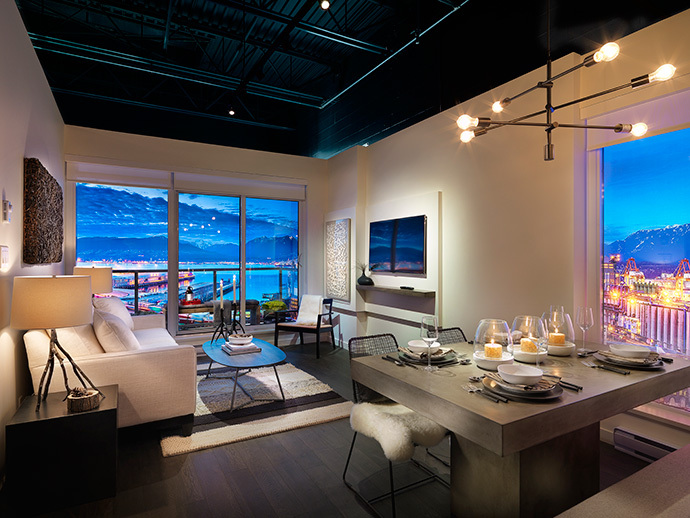 With spacious floor plans, luxe furnishings, and incomparable views added to the mix, you may find your home becoming the gathering place for all your friends. The outdoor spaces offer plenty of room for reading, relaxing, or entertaining, with large, leafy trees providing shade for those who like to stay cool and dry under the open sky. The amenity spaces will include a fully equipped fitness centre, meeting rooms, and space for urban agriculture, giving green thumbs the chance to garden. Living in Strathcona, Vancouver is at your doorstep. Direct bus routes are right out front and the Union Street bike path is just blocks away. Even if you’re not a cyclist, be sure to visit the family-run Benny’s Market, which has been serving outstanding sandwiches in the same Union Street spot since 1917. 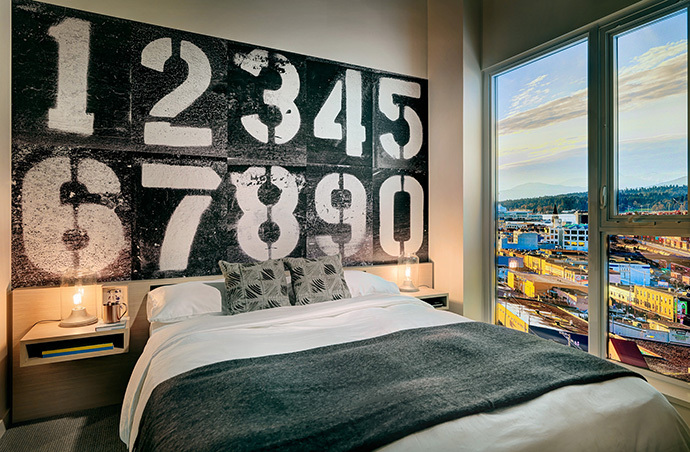 Whether it’s shopping, dining, cycling, walking, doing business, or exploring Vancouver’s thriving cultural scene, you’re well-positioned living here. Your Neighbourhood: Vancouver started here, and begins here. With roots dating back to 1865, Strathcona is Vancouver’s oldest residential neighbourhood. With its close proximity to downtown, it couldn’t be more conveniently located. Chinatown, Gastown, Railtown and Commercial Drive are your neighbours. What makes a community a home are the people who live and work within it. Some who call Strathcona home have deep family roots in the area; others are choosing the neighbourhood because of its character and convenience. This is real Vancouver, and these are a few folks who are proudly Strathcona and proud of their neighbourhoods.